Much like how Generation Z cannot remember life before social media, or if the Spice Girls are real, I don’t remember occupying this planet without knowledge of the iconic, black, Steve Madden chunky heeled loafer. This particular shoe was everywhere in the late ‘90s and early ‘00s, as popularized by cinematic heroes like every witch in the 1996 cult film The Craft, and probably Clueless. Stylistically, they scream “Catholic school girl uniform” with some edge—some lift—the foot equivalent of hiking your pleated, plaid skort up an inch after passing unsuspecting nuns in the hallway. They were, and in my humble, unprofessional opinion, still are, very cool. 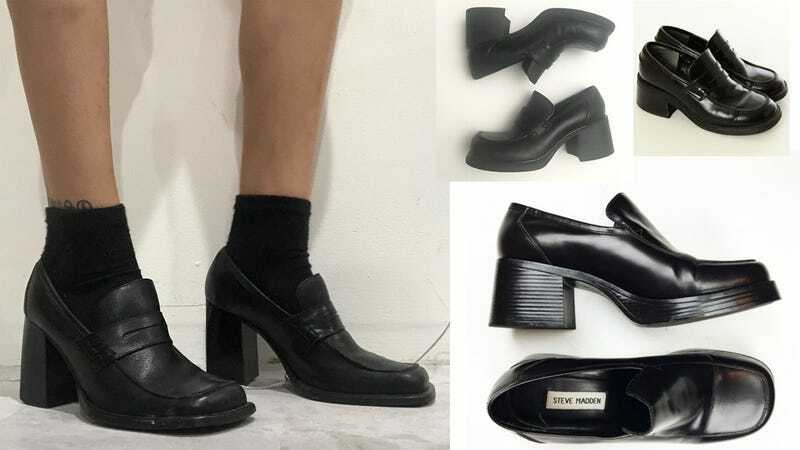 In the modern era, when all fashion is ‘90s fashion, these shoes are certainly back in vogue—and if they’re not —it’s likely that they will be on the feet of Instagram influencers in no time. Think of the benefits: the Steve Madden chunky loafer gives some height. They’re adorable. They’d pair beautifully with hair barrettes, which have are also back from the dead. For all those reasons, plus a healthy, inescapable dose of nostalgia fueling this blog, I’m gonna go ahead and say that yes, while some of you may be experiencing middle and high school war flashbacks from the very image of these tall loafs, they are indeed good shoes. What do you think? Are you on the correct side of history, and think these good shoes are, in fact, good? Or are you some kind of chaotic evil person who thinks if you wore something in 2001, there’s no reason to wear it again in 2019? Defend your incorrect opinion to the death in the comments below.